Despite the enthusiasm of the estate agents, it seems that some of the most impressive houses featured in the glossy adverts at the front of Country Life magazine are proving difficult to sell. Whether this is due to a poor local market or unreasonable prices, or just bad luck, here are a few stunning country houses which are still looking for buyers. Another house which has been for sale is Dowdeswell Court in Gloucestershire which was first advertised in 2005 and then sold for £4.75 but then came back on the market in summer 2009 with a guide price of £7.9m (and was featured in this blog). When serial restorer James Perkins took on the house it had been a 46-room nursing home resulting in a huge restoration project and since he sold in 2005 has moved on to restoring other country houses including Aynhoe Park. The grade-II house was built between 1833-35 by local architect Charles Paul of Cheltenham and was originally three storeys but during the 1920s the top storey was neatly removed. The more manageable house is a beautiful example of neo-Classical detailing combined with modern comforts. The house is available through either Knight Frank or Savills. The final property for this list is the impossibly beautiful Compton Pauncefoot Castle in Somerset which has been for sale since 2006. Built in 182o, the grade-II listed house sits in a 1,278-acre estate with 40-acres of stunning gardens and lakes. Originally on the market for £22m, it failed to sell even during the boom years of 2007-8 and despite 20 buying agents being invited to a launch event, and being featured in the The Sunday Times, it’s now being sold at auction – though I suspect the reserve would be near the current price advertised on the agents websites of in excess of £17m. Perhaps the fact that it’s only for sale as a whole may have put off those who might just want the house and immediate grounds – but this would deny the owner the certainty of privacy that the surrounding estate would bring. The house is available through Bidwells and Knight Frank (who despite putting it as their lead advert in Country Life this week fail to have it on their website). 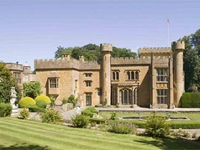 This entry was posted in Comment, for sale, News and tagged architecture, bidwells, compton pauncefoot castle, country house, country life magazine, dowdeswell court, estate, for sale, gloucestershire, grade-i, grade-ii, knight frank, leicestershire, listed, noseley hall, parkland, somerset. Bookmark the permalink. Thanks Rupert – I’ll see if I can find out anything more on this.